Hello July! We are entering the 2nd half of 2015 so how has the 1st half of the year treating you? Have you been keeping up with your resolutions. I hope I do achieve some of mine. Since last week I have been using this new MarySharon SPA Sleeping Mask, I woke up with looking fresh and radiance. If you followed my instagram you will realized that prior to this actual size I did received a sample size of this SPA Sleeping Mask. That was for me to try out the texture and whether my skin is suitable for the products or not. After trying it I can feel the moisture, then a week after that I received the actual product for further review. I apply it on my face and neck once a day for continuously every night for at least 7 days. By the way, girls please do not neglect your neck areas because the signs of aging will show on our neck and hand. Kindly take a look at your neck and hand is there any deep lines or wrinkles or not? I know our face is important but please be gentle and take care of our neck and hand plus other part of our skin as well. After applying the SPA Sleeping Mask on my whole face and neck I leave it to dry. It absorbed into my skin, after like 30 minutes I tissue off the excess there is no stickiness or oiliness. It’s safe to leave it on overnight and go to bed. Don’t worry the mask doesn’t mess my pillow as well. The texture of the mask is soft white creamy type but it’s not too thick. I can easily spread the mask across my skin. There is a mild cooling sensation immediately after I applied it on my face. The mask has no scent and fragrance free. The first 3 days used it I can feel that my skin is moist and hydrated. This SPA Sleeping Mask is best use when we were exposed to the hot sun during the day, at night we really need a nourishing mask to replenish the moisture back to our skin and also it is also soothing. After a week using it, the skin starts to show radiance and glowing when I wake up. I will continue to use it every night to bed for another 7 days and then might use it on alternate night or wash it of after 20 minutes. I am afraid it might be too rich for my skin. Tips: another quick tips to boost skin radiance and make our makeup more lasting is that we can apply the SPA Sleeping Mask all over face, leave it for 5 minutes then wash off and followed my our makeup. I have dry and dehydrated skin so initially I use it every night and leave it on till the nest day. After 2 weeks I will use it alternately or wash it off after 20 minutes. If you have combination or oily skin you might need to alter it to your skin conditions, perhaps use it twice or three times a week. Overall the SPA Sleeping Mask is suitable for my dehydrated skin type and doesn’t cause any irritation, rashes or allergy. I like the soft texture and the results. My skin is more radiance the mask helps to improve my skin hydration, firmness and skin smoothness. 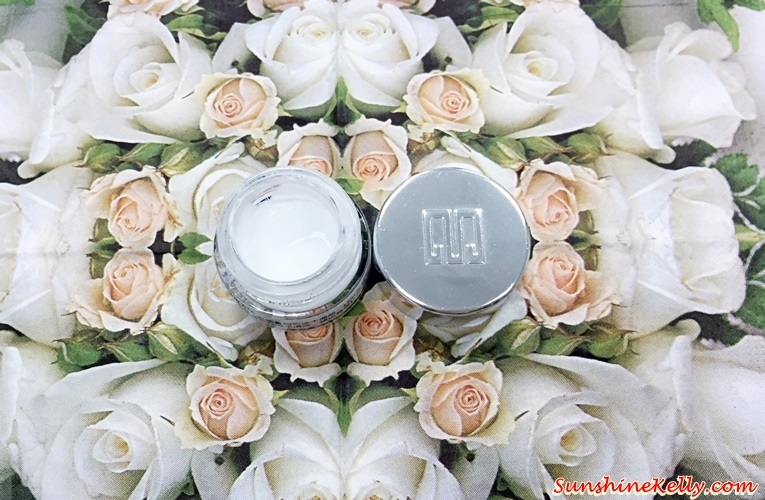 After using MarySharon Queen Radaince Eye Essence the skin around the eyes were revitalized, hydrated and smoothened. Under eye puffiness, lines and wrinkle, appearance of under eye darkness diminished after 2 weeks’ of continuous use. 98% of the females were satisfied with the effect of Marysharon Queen Radiance Eye Essence. This is MarySharon’s exclusive seaweed moisturizing formula Golden seaweed essence combats dry skin effectively. With the power of nature’s legendary moisturizer, it provides extra aqua for extremely dehydrated skin. Its unique water-locking net on the skin surface, enables the skin to regain its vitality. Regulates oily skin, removes dead skin, improves dull skin and restores skin’s suppleness. This is a revolutionary deep cleansing charcoal mask. Restores skin to amazingly clear and flawless. Remove blackheads, whiteheads and accumulated dead skin cells. I have good new to all Chi Lam's fan in Malaysia. 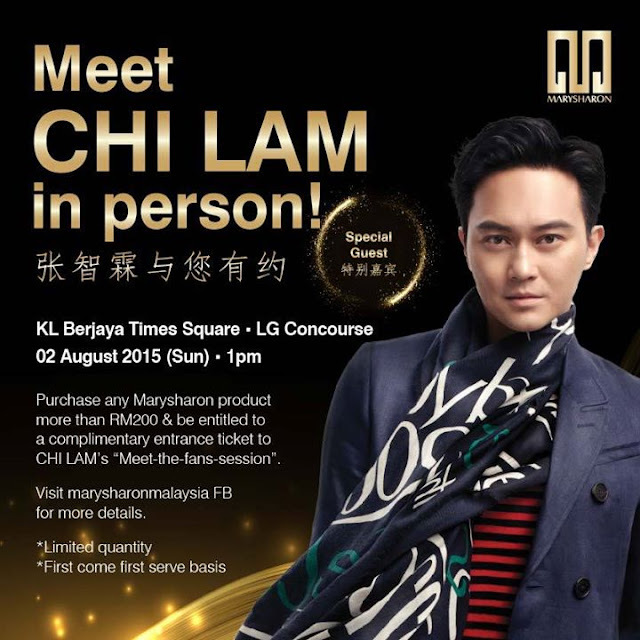 With any purchase any MarySharon product more than RM200 you are entitled to a complimentary entrance ticket to meet Chi Lam in person this coming August 2015 at Chi Lam’s Meet The Fans Session at Berjaya Times Square, Kuala Lumpur on 2nd August (Sunday) at 1pm. Limited quality and first come first served basis. To redeem the ticket please check out MarySharon Official Facebook or call 03-8062 2743/6. Availability: MarySharon products are now available at Watson, Sasa & Shills Beauty Houses. Great review. Thanks for giving it a try and sharing with us! Looks like a great luxury brand. Silver container looks so classy. The cream itself looks luxurious. Must be expensive. Who is Chi Lam? A singer? A model? An actor? Your face looks very clean and hydrated. Silver container is very classy and gives you a feel of silver facial. You look so very radiant and beautiful <3 <3 seems the product works well too! This sounds similar the the body shop bouncy sleeping mask. I've been using it for about a week now and it is just amazing. I'm not very patient with mask applications but this looks like an easy mask to apply. It does look a little luxurious so I assume it's quite pricey? You are really pretty even without make up. This mask can help keep your skin be clear and radiant. Sounds a nice product to try. facial mask that is not messy is something my wife likes. Nice review of beauty products and it's refreshing to have this sleeping mask. It works well for you. The products seems to be suitable for your fair skin. It does works well on you. Hi, can i share your review in my social network? I'm Marysharon agent/dealer.